COASTAL NORTH CAROLINA – Access to much of the southeastern and central North Carolina coast remains cut off and the routes that are available are tenuous as floodwaters flow down the watershed, inundating major cities and towns. State transportation officials said on Twitter Thursday that about 750 roads remain closed, reduced from 2,200 earlier this week. Wilmington remains almost an island with only a handful of routes in and out of town. U.S. 421 was reduced to one lane each way and traffic to a slow crawl Wednesday and was impassible by Thursday morning. The road is closed at the Pender-New Hanover County line. North Carolina Department of Transportation officials announced that there were no reliable routes into Wilmington after city and New Hanover County officials suggested using N.C. 24 to Jacksonville and U.S. 17 into the city. The state for now is asking evacuees not to return to the area to allow faster travel for emergency and recovery crews heading to the area. Several major intersections in Wilmington have been reconfigured as temporary roundabouts, city officials tweeted Thursday. NCDOT’s official status of routes in eastern North Carolina lists where travel is not advisable due to flooding. Included counties are Bladen, Brunswick, Columbus, western Craven west of U.S. 17, Cumberland, Duplin, Harnett, Hoke, southern Johnston south of U.S. 70, Jones, Lenoir, New Hanover, Pender, Robeson, Sampson, Scotland and southern Wayne south of U.S. 70 Business. An online NCDOT map is updated as incidents are reported and may be reached via the department’s Traveler Information Management System and its Hurricane Florence page. High waters are expected to work their way down to coastal counties over the weekend, with the Cape Fear River expected to crest in Wilmington early next week. Much of the flooding in eastern North Carolina rolled through areas that have yet to recover from Hurricane Matthew in 2016. In a number of communities, floodwaters exceeded levels reached in both Matthew and Hurricane Floyd in 1999. The Cape Fear River at Burgaw crested Wednesday afternoon and remained above 25 feet into Thursday, topping the record of 22.48 feet set during Floyd. At the Cape Fear Lock and Dam No. 1, the river is already above the record set in 1945 of 29.8 feet and is expected to rise a foot above that and not crest until late Sunday. After a helicopter tour of areas in North and South Carolina, Army Corps of Engineers Lt. Gen. Todd T. Semonite, commanding general and chief of engineers, said his main concern was managing the water flowing through the watersheds. Semonite said there are worries about some smaller dams, but that none of the Corps’ dams are threatened. The Corps opened the state’s two seaports at Wilmington and Morehead City Wednesday, but Semonite said that doesn’t mean channels at each are at their optimal depths. Semonite said inspections in Wilmington put the channel at 37 feet because of an object, possibly a sailboat, in the channel. He said divers were expected to inspect the area Thursday and once identified, the object would be removed. 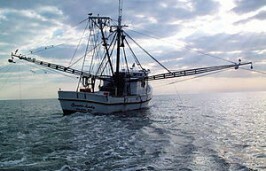 The dredge Currituck was being readied to clear inlets and channels, he said, and the Corps had launched seven assessment boats to check the state ports and shallow-draft inlets. Meanwhile, most coastal counties are making the shift from rescue to recovery and clearing the way for evacuees to return home. Brunswick County lifted its mandatory evacuation Thursday but warned those returning to be aware of flooded areas, especially around the Waccamaw River, which forced a quick evacuation of part of the county earlier this week. Utility crews had restored power to more than 1.2 million who lost power in the storm, although some areas won’t be able to be reached until floodwater recede. On Topsail Island, an island-wide curfew remains in effect from 9 p.m. to 7 a.m.
Power and water services have been restored at Topsail Beach. Property owners are allowed to return to the town with proper identification and proof of ownership. A curfew remains in effect nightly. The town’s ocean shoreline is intact and most homes in town sustained minimal damage. In Surf City, trash service resumed on the island portion of town on Thursday. North Topsail Beach Town Hall remains closed and town officials are advising property owners that the town cannot guarantee emergency medical and fire assistance. In an email to residents on Wednesday, North Topsail Mayor Dan Tuman reported that about 874 structures sustained minor damage and an estimated 77 structures had major damage. A team from the North Carolina State Building Code Enforcement Office arrived in town Wednesday to help identify properties “not fit for habitation and might be at further risk should they be connected to the town’s present water and electrical service,” according to Tuman. The town’s Facebook page has a link to a National Oceanic and Atmospheric Administration satellite imaging app that allows viewers to observe a street view of their homes. Street-level videos are available on the town’s YouTube channel. Holden Beach Mayor J. Alan Holden on Thursday ended the state of emergency that was in effect in town. Holden Beach at 1:45 p.m. removed the roadblock leading into town and reopened the beach to the public. Sunset Beach Town Hall reopened Thursday morning, though, in an email alert to property owners, town officials state that Brunswick County is asking residents who evacuated to wait before returning. Many roads in the county are blocked, flooded, washed out or structurally damaged, making them impassible. Gas, food and water supplies are also limited in many areas, according to officials. Shelters remain open at West Brunswick High School in Shallotte and South Brunswick High School in Boiling Spring Lakes. A boil water advisory has been lifted in Oak Island and the island’s water system has resumed normal operations. A few areas remain without sewer service. Bridges are open. An area of East Beach Drive at East 55th remained closed. The town’s convenience site will be closed Friday. The county landfill and convenience sites are closed until Monday because of flooding. Bald Head Island remains under a state of emergency. The village’s council meeting scheduled for Friday has been canceled. A mandatory curfew remains in effect for the village. Bald Head Island Marina and Deep Point Marina remain closed until further notice as well as the Cape Fear River, which has not been officially opened by the U.S. Coast Guard. Crews were continuing to pump from lagoons to ocean outfalls and maintain gravity flow of floodwaters to Bald Head Creek. After spending days in the crosshairs of Hurricane Florence’s’ path – part of that time as a heart-stopping Category 4 storm – counties in the northeast corner of the state largely escaped the severe impacts still ongoing in much of North Carolina. A southerly turn as the storm approached the coast largely spared the northern coast the worst effects of predicted storm surge, wind and rain. Even the Outer Banks, with its exposed coastline and vast estuarine system, emerged essentially unscathed. 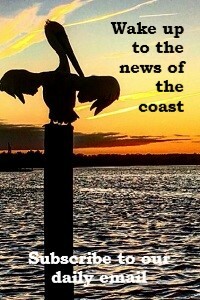 “We were so blessed this time,” said Kris Noble, manager of Hyde County, which includes vulnerable Ocracoke Island. Although Hyde did have some significant flooding and N.C 12 on Ocracoke was damaged, the storm impacts were not nearly what Noble and other coastal communities in the northeast had feared. If the storm had gone just 50 miles to the north over Carteret County, there would have been a lot more wind, rain and surge on the Outer Banks, said David Glenn, meteorologist at the National Weather Service in Morehead City. Glenn said that the storm system was anomalous compared with the typical way a hurricane tracks. As Florence approached the coast from the southeast, high pressure was building across the northern Atlantic, which helped steer it more toward the west. Then it became wedged between high-pressure systems, resulting in dissipation of the steering currents and a more southward drift. Meanwhile, a southwesterly wind shear weakened the force of the storm, but the wind field enlarged. Wind gusts of 100 mph were recorded in Fort Macon and Carteret, Craven and Onslow counties, he said. In Frisco on Hatteras Island, the maximum gust recorded was 67 mph; in Manteo it was 40 mph; and at Oregon Inlet, 51 mph. “We were very lucky across Dare County,” said Drew Pierson, the county’s emergency manager. 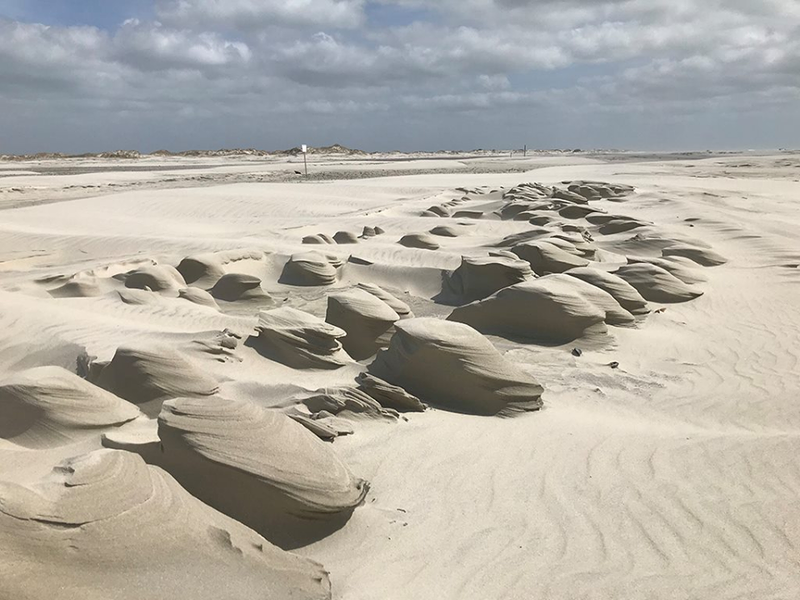 There was some ocean overwash on Hatteras Island, he said, “but relatively little compared with other storms.” Storm surge was also much less than the 4- to 6-foot surge anticipated. “There was a large body of water with a lot of energy behind it,” Pierson said. Although official totals were not yet available, Pierson estimated that there was about $500,000 in damage across the entire county. Close to 250,000 people were evacuated from Dare, including tourists, and there was also an evacuation of Ocracoke. Despite that, unlike past years, there has been very little criticism from residents or the business community about the mandatory evacuations. Flooding was most significant in mainland areas of Hyde, particularly Ponzer, Scranton/Sladesville and Engelhard, and the northern section of N.C. 12 on Ocracoke was damaged, according to Hyde County Emergency Management. Hyde County’s initial assessments completed and submitted to the state on Thursday show a total of 255 homes had been damaged. Of those homes, 36 homes were either destroyed or received major damage. Local volunteer fire departments conducted “windshield assessments” after the storm of all the mainland homes, and emergency officials distributed tarps, water and food where needed. Local property owners have also been encouraged to contact the county at 252-926-3715 to report damages. Until repairs of N.C. 12 on Ocracoke are completed and the dunes are restored, the Hatteras-Ocracoke ferry service will remain suspended. Noble said that damage assessments to crops, infrastructure, county buildings and housing were in the process of being compiled. According to a state Department of Transportation statement, most of the flood tide on roads in Division 1, which includes the northeast, had subsided, although some secondary roads in low-lying areas may still have water on the pavement. Tyrrell County, which is bordered by the Alligator River and the Albemarle Sound, also fared better than expected, said county manager David Clegg. “We did well – we missed a huge bullet,” he said. Countywide, Clegg said, there was minimal structural damage, although there was flooding – about a foot or so at its deepest. Currituck and Pasquotank counties reported minor “nuisance” flooding, but no long-standing impacts. But Beaufort County suffered severe flooding along the Pamlico River, which surged as much as 10 feet, said Chris Newkirk, the county’s operations chief for fire and emergency management. Newkirk said the worst of the flooding happened in Washington and Chocowinity, and to a lesser extent, in Belhaven and Aurora. “We had water in areas that we do not typically see it from hurricanes,” he said. At one point, 12,000 people in the county had lost power, Newkirk said. As of Wednesday, all but 1,100 people served by Duke Energy on Highway 33 have had their power restored. Although the water has mostly subsided, Newkirk said there are areas in the county with “substantial” damages. A few total losses of properties have been reported near Broad Creek in Washington. Still, he said, the storm surge is what was predicted, yet the county was spared the wind damage it had braced for. Catherine Kozak, Kirk Ross and Trista Talton contributed to this report.